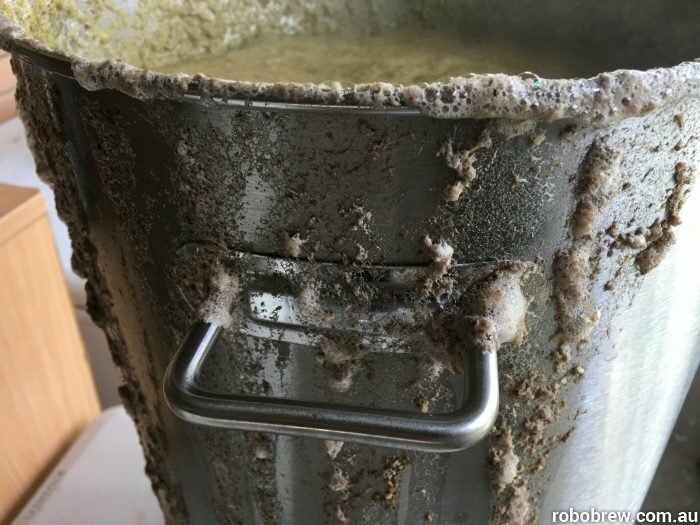 As your brew reaches boiling point, there’s generally a few minutes where the build-up of foam — known as the hot break — can cause as a boil over, coating the outside of your RoboBrew in a mess of caked-on foam and wort. 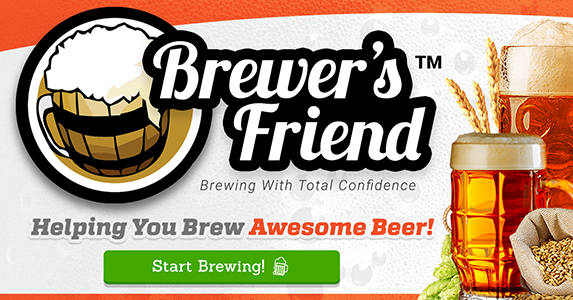 It’s best to avoid this in brewing because the foam can quickly make a mess of your brew kettle and the surrounds. 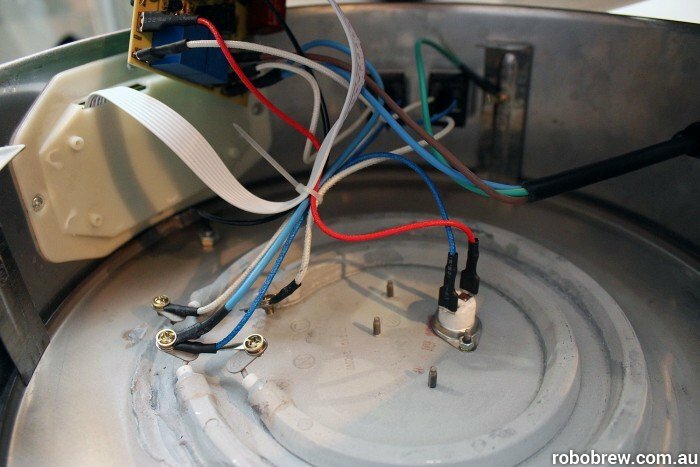 With the RoboBrew, its integrated electrical components mean it’s particularly important to avoid this phenomenon. The RoboBrew’s electronics compartment has vents that allow it to breathe. What lets air in can also easily let liquid in. Even though they’re angled downward, they’re not impervious. Looking at the disassembled upside-down RoboBrew, you can see air vents along the sides at the rear. The RoboBrew isn’t sold as a waterproof piece of equipment. It is designed to safely hold liquids inside, not its outside. The entire vessel is earthed (the green and yellow wire seen above), but as the saying goes, water and electricity don’t mix. 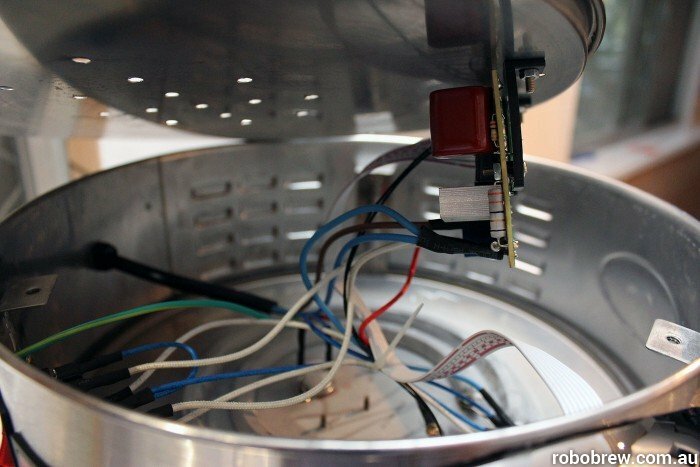 Take a look at our dissection of the RoboBrew for a closer look at its internal components. Apart from the dangers of mixing electricity and water, the boiling hot vessel will quickly cake on any foam and unlike the inside of the RoboBrew, you can’t leave the outside to soak in your preferred cleaning solution. Boil over generally only happens in the first few minutes of reaching boil and it can be easily avoided. Perhaps the most common way is to simply be on hand with a spray bottle of cold water as the boil first starts. The cold water quickly breaks up foam before it’s able to build up and make a mess. Boiling a smaller volume of wort also means it won’t build up high enough to ever overflow. But with the RoboBrew you’ll generally be using it to capacity if you’re brewing a standard batch of 19-23 litres. There are other solutions other homebrewers use. None I’ve tried myself, but this article over at BeerSmith suggests stirring, glass marbles in the kettle, an additive called Fermcap or skimming the foam as it forms. Prevention is the best method for dealing with boil over. One or both RoboBrew elements during the boil? Can the RoboBrew achieve a rolling boil?